June brings the official start of summertime, and here in Mexico Beach, Florida, we couldn’t be more excited for all the fun in the sun our locals and visitors enjoy every year. It’s hard to pick from our favorite summer beach activities, but we’re here to list six of the best ways to soak up some rays during your Mexico Beach vacation! It might seem obvious, but with the sparkling Gulf of Mexico’s waters right in our backyard, our favorite way to have fun and cool off is playing in the water. Boogie boards and skim boards are a must-have during your beach vacation, perfect for kids of all ages who like to catch the waves back to shore or run along the surf as it crashes on our sugary white sands. Going for a swim is, of course, a perfect option for those looking to stay fit and practice for the Beach Blast Triathlons each spring and fall in Mexico Beach! From riding along on a Jet Ski to just splashing around with family and friends, we can’t get enough of the Gulf. 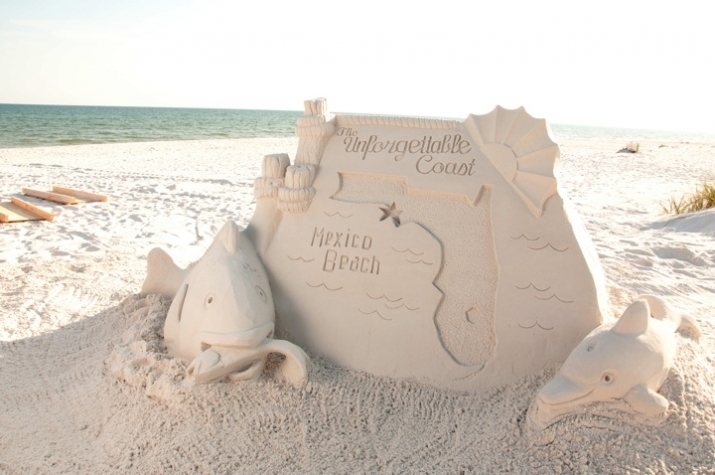 Again, this is a classic beach pastime, but we’re here to tell you that Mexico Beach has seen some pretty incredible sandcastle creations. From the one created for the Mexico Beach CDC a couple years ago by Beach Sand Sculptures to some of the amazing creations we see on the beach every day, taking a stroll on the sand is sure to bring some beachy artwork to your eye. Just a reminder: Please remember to fill in any holes or large motes when you leave the beach for the day, to protect our wildlife and other visitors from injury! Read more about our Leave No Trace ordinance here. Summer reading is essential for all ages, and the beach is the best place (in our opinion) to relax and get wrapped up in a mystery, whisked off into a fantasy world, or motivated with the latest memoir from your favorite celebrity. Get a jumpstart on the school reading list when you spend spread out your towels and blankets and post up under an umbrella (wearing your sunscreen of course!) to escape into the pages of your new favorite book. The sound of the waves is the best background noise. A bike ride, that is! The best way to explore Mexico Beach is on two wheels. Rent a bicycle or bring your own and take a ride along Highway 98 where you can watch the waves roll by as you do. Stop at City or County Pier for a photo op, and then cruise on to Shoobies or MB Sweets and Treats and get an ice cream to cool down. In Mexico Beach, we have over a dozen native species of seashell-inhabiting whelks, sand dollars, urchins, and more. Stroll along the water’s edge at sunset and catch a glimmer from the shells in the sand. Bring your bucket along to collect your favorites, and take them home as a souvenir of your unforgettable Mexico Beach vacation. Download our free Field Guide for more wildlife information. Summertime means fresh Gulf seafood, Apalachicola oysters, watermelon, strawberries, and all the delicious goodies that your family loves. 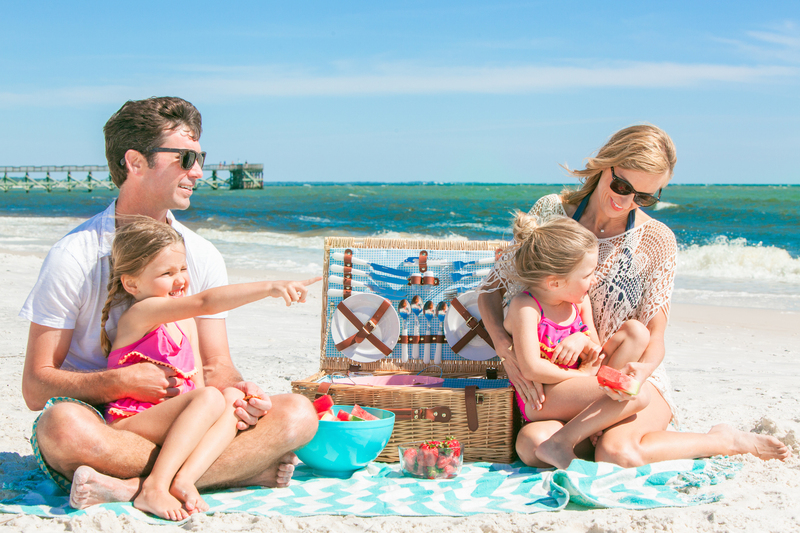 Beach snacks are a must, and we love family picnics with our favorite people in the world! Make memories this summer when you pack up a lunch, don your stylish beachwear, and don’t forget to bring the camera to capture all the unforgettable moments you’ll experience here on the Unforgettable Coast. We hope to see you soon! Plan your Mexico Beach vacation and enjoy all these summer beach activities and more when you visit our Places to Stay page or request a Free Mexico Beach Visitor Guide today.